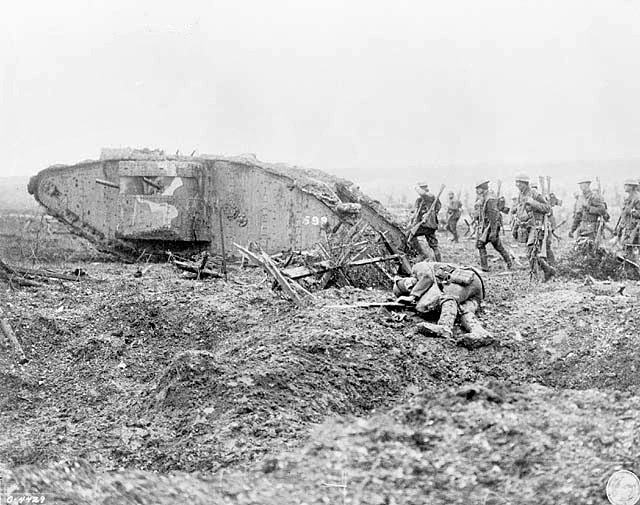 Above: Canadian soldiers following tank at Vimy Ridge. There are now just two North American veterans of “The Great War” or World War I left alive. Both live in the United States, but one is a veteran of the Canadian Army and the other the United States Army. There are 14 surviving veterans worldwide from The Great War. Jack Babcock, age 107, is the last survivor of 619,636 men who served in Canada’s military during World War I. He enlisted in the Canadian Army at age 15 in 1914. Like many others he lied about his age in order to serve. The military found out about his real age and held him in reserve in England until he was old enough for battle. The war ended though before that could happen. Jack returned to Canada after the war, but within two years moved to the United States where he still lives. Canada’s Veteran Affairs Department only found out about him a few years ago when his wife made inquiries about veteran’s benefits that might help her care for him. Frank Buckles, also age 107, is the last living U.S. soldier who served in World War I. Frank lives in Charles Town, West Virginia and remains in good health. Mr. Buckles also lied about his age and joined in 1917, shortly after he turned 16. Frank saw combat in France and Germany. Later in the Second World War he became a POW for 39 months after Japan invaded the Phillippines. Remarkable men both of these survivors, but no more remarkable than any of those who answered the call and served their countries in this terrible “war to end all wars”. As their countries last surviving veterans they have become symbols for all ofthose who served. When they pass into the ages, Canada and the United States will hold services to honor and remember all. One of the others who served was my grandfather, Cuthbert “Bert” Sendell from Toronto, Ontario. Bert enlisted in the Canadian Army in 1915 and served in France driving munition trucks up to the frontlines many times under enemy fire. He returned home to Toronto in 1919. Bert died in 1983. He left behind children, grandchildren and great-grandchildren. Above: Chart of the eclipse from NASA. 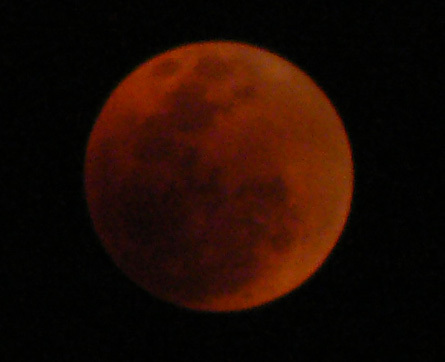 Last evening I was treated to an incredible natural event, a total lunar eclipse. I have seen these before, but not under the ideal conditions of last night; clear sky, no wind and an unusually bright full moon displaying itself for its admirers to gaze on. Here in Calgary, Alberta the full moon rose in the northeast and first appeared low just above the horizon. Gradually it became higher above the horizon as total darkness fell and by this time was sparkling clear. The night sky filled with stars that shone even through the city lights. At about 6:40 pm local time (Mountain Daylight Time) the lower left edge of the moon began darkening. Over the next sixty minutes the darkness gradually veiled the full moon. By 8:00 pm the sky was completely dark and the moon was entirely obscured with the shadow of the Earth. Above the moon appeared the bright star Regulus and to the lower left Saturn shown brightly. Using high-power binoculars I was able to see the eclipse in all its magnificence. Before the moon was covered the mountains and plains of the moon were able to be seen in amazing clarity. The total eclipse lasted almost an hour. Lunar eclipses occur when the moon passes into Earth’s shadow is blocked from receiving all of the sun’s rays. Because it still receives indirect sunlight through Earth’s atmosphere it doesn’t go totally black. Usually the veiled moon appears slightly reddish or brown depending on how much dust and cloud cover are in the atmosphere. Last evening it had a reddish hue from my vantage point. This was the last total lunar eclipse until 2010. In 2007 there were two, but only one was visible here and cloudy conditions prevented ideal viewing. The other treat for stargazers was the appearance of the second brightest star in the night sky, Regulus from the constellation Leo. This star is about 77.5 light-years from the Earth and is 33 times larger than the Sun, our star. The light my eyes saw last evening had taken that long to reach me. That is simply incredible. If that wasn’t enough Saturn appeared to the left of the moon. It too was shining brightly, but of course not blinking since it is a reflective object. Regulus being a star was blinking. Today reflecting on this event I feel honored to have been able to see nature’s grandeur displayed for us here on Earth. Many take this for granted, but by doing so they are missing a grand show. Chad is another African country where democracy is at risk and genocide is lurking. Chad was until recently the poorest country in the world; however,the recent discovery of major oil reserves have meant a sudden influx of cash. Crude oil began flowing July 15, 2003 to markets via a 665 mile pipeline to the coast through neighboring Cameroon (Chad is landlocked). Part of petroleum development was an agreement between Chad and the World Bank ensuring that a portion of oil revenues would be set aside and used for health, education and infrastructure in the country. After a controversial election in 2007, the government is now under attack from rebels. Chad military forces have so far been able to fend them off, but the rebels are regrouping and civil war seems imminent. Ever since 1966 rebels have been sporadically fighting each other, and the central government. 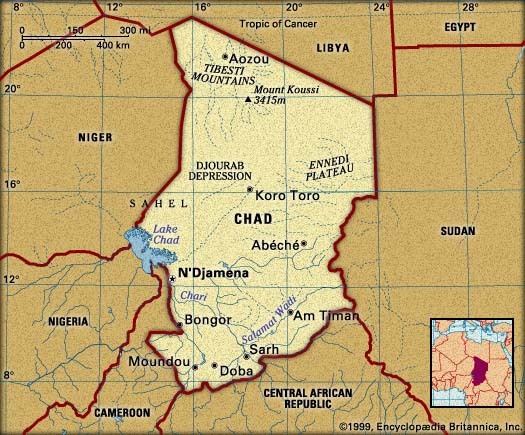 Chad is a West African kingdom that is thousands of years old. Up until 1900 it consisted of many tribal districts without any central government. France took control in 1900 and it became a French colony. On August 11, 1960 it became the independent Republic of Chad. The first multi-party elections were held in 1996. In 2007 violence from the adjacent Darfur region of Sudan spilled over into Chad. The problems in Chad are linked to ethnic and economic roots. There are two major religions, Islam (53%) and Christianity (35%). The other problem is that the Sahara desert is encroaching from the north to the south of the landscape. Only about 3% of the country is arable and that is in the south. Also as mentioned before, Chad doesn’t have direct access to the sea. The only water body is Lake Chad in the southwest and it is shared with Nigeria and Niger. In my opinion most of the civil wars in Africa are the result of the method used to determine national boundaries. The European powers controlled these countries prior to their independence. After the Second World War independence was granted. The borders of the newly independent countries were imposed by the colonial poweres, France, Italy, Belgium, Great Britain and others, regardless of traditional tribal borders. As a result within the countries are multiple peoples, many of whom are traditional enemies of each other. 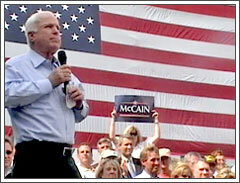 They are expected to become nationalist and work side by side with their sworn enemies. This is just not working. Chad has become strategically important because of its large oil reserves. Tribal warfare is on-going and rebels are using this as an excuse to wipe out traditional enemies. The West needs to start paying attention to countries like Chad. Congo, Sudan, Somalia, Ethiopia and Chad are bleeding. Does anyone care? 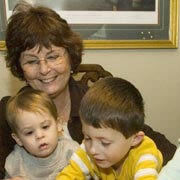 Kathy Casey-Kirschling became the first U.S. baby boomer to collect Social Security on February 13, 2008. She is the vanguard of 80 million other baby boomers in the United States. Canada also has the same large group of these post-WW II babies. The challenge will be to the health care system and the government pension plans. Will the plans be adequate to look after the needs of this large group of citizens? Baby boomers have worked hard for the last forty years or more and now are at or nearing retirement age. I am in that group at age 58. In 2009 I will worked full-time for 40 years. I think in all that time I was unemployed involuntarily for about two weeks. I have a message for the young people of today. Save for your retirement early, even if it is just small amounts to start. The last 40 years have flown by for me, they will for you too. We aren’t here for a long time. To have a good time including in your later years start planning early. Co-incidently Kathy was born one second after midnight January 1, 1946 and is officially considered the first baby boomer to be born. She retired at age 60 and has been giving back to the community through volunteer work. You are currently browsing the WRITINGS & RAMBLINGS blog archives for February, 2008.